The second half of season 3 is getting ready to start this February 10th and we have the episode titles for the rest of the third season. While many already knew about episode 9, “The Suicide King”, the others are some new ones that weren’t known before. We can start to guess what these may mean, as there is always something in the title, but we will leave that up to your imagination. There are some spoilers floating around but we decided to keep this “spoiler free”. 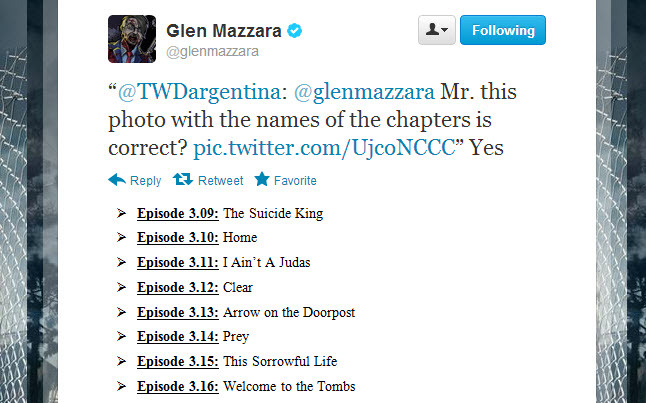 We do know that Glen Mazzara confirmed the titles on his Twitter so there shouldn’t be any speculation about them. The only thing we can speculate about at this point is to what they mean. We can see some of the titles such as “Home”, and “Arrow on the Doorpost”, which makes me think of a few characters that could revolve around. The other ones are a more of mystery, unless of course you have read the The Walking Dead comics, which would give you a slight advantage. Either way, we have less than a month before the rest of season 3 starts, so hold on and get ready to watch more of the greatest show on television.